6 The king and his men marched to Jerusalem against the Jebusites, the inhabitants of the land, who said to David, "You will not come in here, even the blind and the lame will turn you back"--thinking, "David cannot come in here." 7 Nevertheless David took the stronghold of Zion, which is now the city of David. 8 David had said on that day, "Whoever would strike down the Jebusites, let him get up the water shaft to attack the lame and the blind, those whom David hates." Therefore it is said, "The blind and the lame shall not come into the house." 9 David occupied the stronghold, and named it the city of David. David built the city all around from the Millo inward. 10 And David became greater and greater, for the LORD, the God of hosts, was with him. 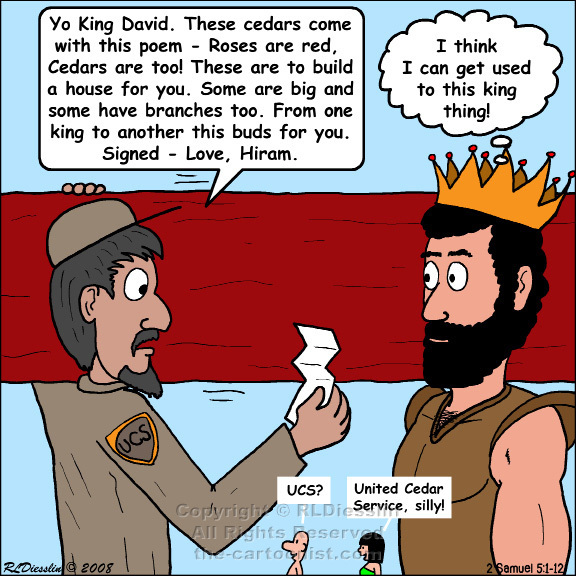 11 King Hiram of Tyre sent messengers to David, along with cedar trees, and carpenters and masons who built David a house. 12 David then perceived that the LORD had established him king over Israel, and that he had exalted his kingdom for the sake of his people Israel. This is very cryptic until it is revealed that this is a bit of school-yard taunts. The Jebusites are telling David that even their blind and lame will repel his soldiers if he attacks. David then takes the city with a small force that sneaks in through the water shaft. He who laughs last, laughs best. Jerusalem is a city central to the region and has the added benefit that it had not ever belonged to any of the 12 tribes, so he gets to claim it (aka the City of David). Donald Trump, eat your heart out.